This week, I'm going to show you how to easily transfer your PS3 game save to another region (e.g. Japan to US, US to EU, etc.). This method is incredibly effective most of the time and everything should work 100% once transferred—all your progress, trophies, stats, etc. In this guide, I'll be using as an example a Dynasty Warriors 8 Japanese game save which I will be transferring from Japan region to US region. You will need to have your game save stored and accessible on your PC as you will be modifying its contents. The easiest way to do this is to insert a FAT32 formatted USB stick in your PS3 and copying the game save to the stick, then copy them onto your PC. When copying from PS3, the game save should be located on your USB stick in PS3\SAVEDATA. Copy the entire game save folder to your PC. Put them somewhere you can remember, such as the desktop. Important! Always make a backup of your game save in case anything ever goes wrong. I recommend creating a new folder called "SAVEDATA BACKUP" and putting an extra copy of your game save there. I will not be held responsible for any damages caused to your game save if you fail to make constant backups. Bruteforce Save Data is a powerful game save data swiss army knife for PS3. It allows one to decyrpt and encrypt game save files, add cheats, transfer region, transfer saves to another owner and more. 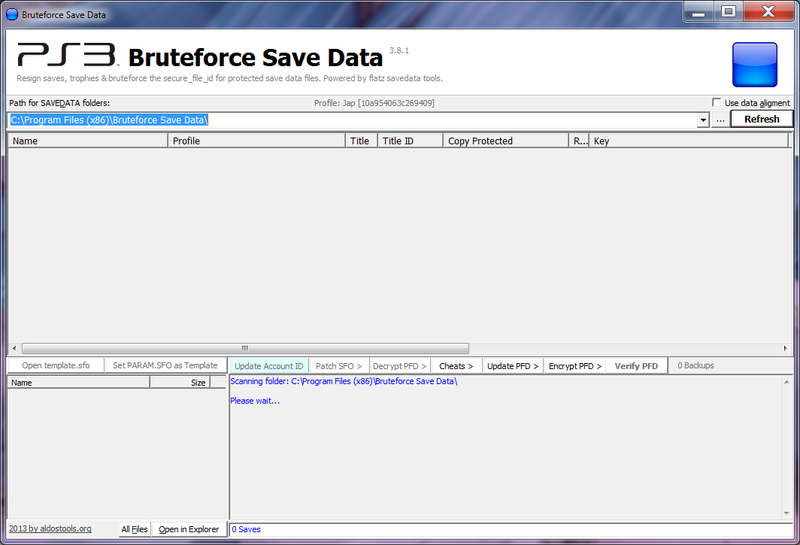 Download Bruteforce Save Data here. Once it's finished downloading, extract the RAR file and run the installer. Do not launch the program yet. Drag/copy your game save folder (e.g. NPJB00325-SAVEDATA) to this "SAVEDATA" folder. Now it's time to run Bruteforce Save Data. If you receive an error message regarding msvbvm50.dll missing, you need to install Visual Basic Runtime 5. You may be also requested to download Microsoft Visual Basic C++ 2010 (x86) if you don't have it installed in your system. Downloading and installing this is a must! If all is well, you should be greeted with a nice big window. It may ask you to update cheats repository, click the "Download" button to download the latest database. This is important because it will update your game.conf file with the latest game keys to ensure saves can be decrypted and encrypted. Ignore any of the program's requests to input a console ID and User ID. You don't need to setup a PARAM.SFO template either. Just leave them all at default. The first thing we need to do is click on the "..." button and select the "SAVEDATA" folder of where our game save is (the one we created earlier). So go ahead and do that. Once selected, your game save should show up. SAVEDATA folder selected as the path. Take note of the "Key" section, there should be numbers in this field. If it's empty, you'll need to select the game save and hit F6 to Bruteforce the key. Once it's Bruteforced, press the "Refresh" button to refresh everything. The "Key" section should have now some numbers. 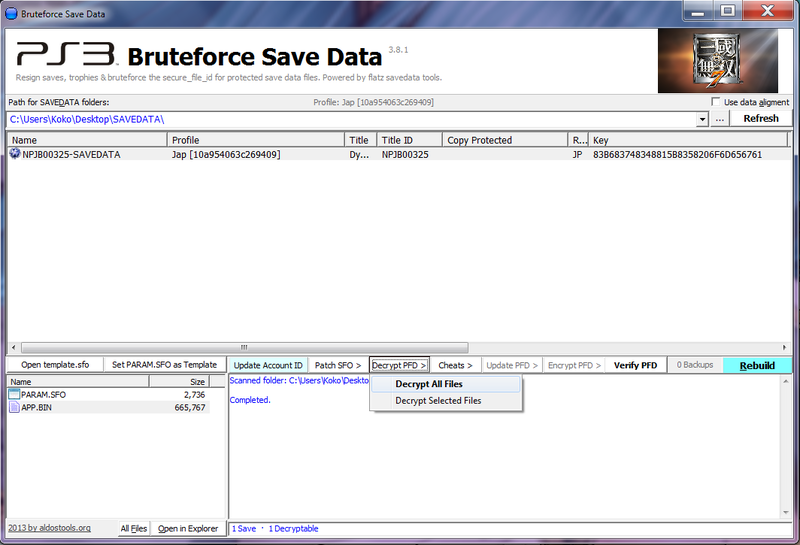 Back in the Bruteforce Save Data window, make sure the game save is selected on the top window and click on "Decrypt PFD" button then "Decrypt All Files". You can also simply use Ctrl + D to decrypt. After it has successfully decrypted, you should see the window turn green. This indicates the game save files are decrypted. Ignore any disc hash key errors you get. In order to change a game save to another region, we need to change its Title ID. To do this, right click on the game save and select "Change Title ID/Region". You can also simply hit Ctrl + I to do the same task. How to activate Change Title ID/Region. You should now get a pop-up window requesting you to enter the new Title ID. Replace the current ID with the Title ID of your destination region. In my case, I want to change the Title ID to NPUB31234. This is the Title ID of the US version of the game I'm using—Dynasty Warriors 8. Your Title ID will be different if you're using a different game. You can use PS3Index to find the Title ID of your game in its region. In order to actually use the new game save on the PS3, we need to re-encrypt it. If you leave it decrypted (green), the game will tell you its corrupt and force you to delete it and create a new one. 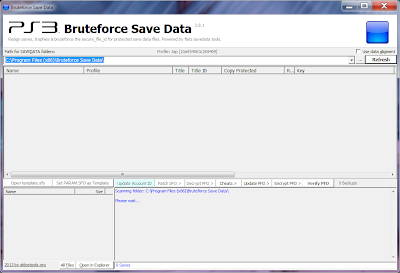 In Bruteforce Save Data with the newly created game save selected (top), click the "Encrypt PFD" button then select "Encrypt All Decrypted Files". How to encrypt the decrypted game save. The green will vanish and the window will return back to white color. If you get an error dialog box indicating "Missing secure_file_id", the game save needs its key first. You can get the key easily by clicking on the game save, then hitting F6 (Bruteforce). Once Bruteforced, click the "Refresh" button. The key field for that game save should then be populated with numbers. New US game save encrypted. As an option, you can also re-encrypt the bottom original game save as well with the same steps. You are pretty much done. All that's left to do is to transfer the newly created game save to your PS3 and test it out. If you're transferring from Japan region to US/EU or vice versa, you'll probably notice that the game save still retains all its Japanese or English title, description text and icon; even though we completely changed the Title ID/Region. Don't worry about this regardless, just copy it over and replace your current game save with it. When you save over it again in the actual game, it will then convert all the Japanese or English text and the game icon to the Japanese or English counterparts. Dude this tutorial was solid gold. If I ever meet you the first round of beers is on me. Hi i want to ask when u go to online mode in either jp or us version, is there anyone is hosting at all? And if you host, how long it usually take for people to join you? I am playing Chinese version. There is basically no one hosting at all in online mode and if i host it takes like 30 mins or more to have someone to join. Does this happen in jp and US version? Hi i am not able to open the bruteforce, it said MSVBVM50.DLL is missing from my computer and i dont kno what it is. Hi i used all the steps you explained with black ops to play the DLC zombie maps. My black ops is the US version but i can only download EU DLC. however i still cannot play my european DLC. any idea of how to fix this? how can i use this to transfer my save data usb stick to ps3 & have it show up? Awesome ive been playing a patched jpn ffx hd and want to convert my save to work with the us version so then I can transfer it to my vita!!! Trying to resign MGS Peace Walker HD from my old account to play on my new account. you could convert the save from japan to usa. and indeed it comes to save which one gets here. I really tried everything but some how it does not work. always renounced the ps3 save is corrupted. You're a star, thank you! Although being a bit of an idiot it took me a while to realise I needed to 'Switch Careers' to find the save. I owe you a drink. Hi, I'm trying to convert Final Fantasy XIII-2 save file from R2 [BLES01269] to R3 [BCAS20225]. I'm not able to copy the new save file to my ps3 as it indicates that the file is corrupted. Is there anything I could do? okay i managed to get everything to say OK. Ran brute force as admin, then redid all the above steps. After doing all these things IT WORKS!!! I'VE BEEN TRYING TO DO THIS FOR HOURS!! THANK YOU SO MUCH WONDERPIERROT! Hello, Anonymous! I have a case here when I convert my Metal Gear Solid V: Ground Zeroes (US) to (AS), then play the game, it bypasses the newly created save data (AS) when it promptly loaded early. BTW. My MGS:GZ disc is Region 1 US (r-all). Cannot believe this software worked! I bought Assassin's Creed 3 and then got all of it's DLC (UK PSN store). Towards the end of my playthrough I realized there was no DLC showing up in game and that I had somehow acquired the US version of the game! I did not want to redo my progress on a new UK version! I picked up a UK version cheap, used this software to change the region code and boom it's working fantastic! I did not have to decrypt or encrypt anything though! For me the key was 'unprotected' - all I did was change the title ID and immediately put it back on the console and it worked fine. Thank you! Yeah! did it for Yakuza 5 :D Thanks Heaps Buddy!! sir. can you help me with my FF 13 save files ? Hi, This is a good post, indeed a great job. You must have done good research for the work, i appreciate your efforts.. Just visit on my site. Thanks buddy. It's not working with JAP Yakuza 5. You could be eligible to receive a PLAYSTATION 4. Fix for Slowdown Issue with DW8 on Xbox 360? Ever Used PhotoFunia? You Should!